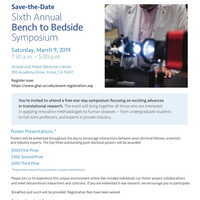 Sixth Annual Bench to Bedside Symposium focusing on exciting advances in translational research. The event will bring together all those who are interested in applying innovative methodologies to human diseases - from undergraduate students to full-time professors, and experts in private industry. Poster Presentation competition with cash prizes.